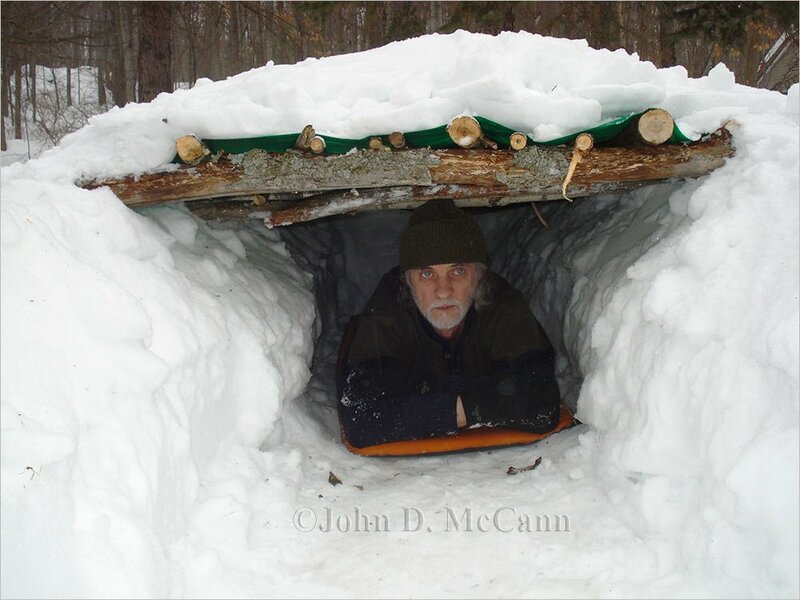 When we talk about making shelters in the snow it often invokes the imagination of many who recall images they have seen, probably in the movies, of a dogsled pulling up to an igloo and the rider getting off dressed in fur and entering a warm humble abode. 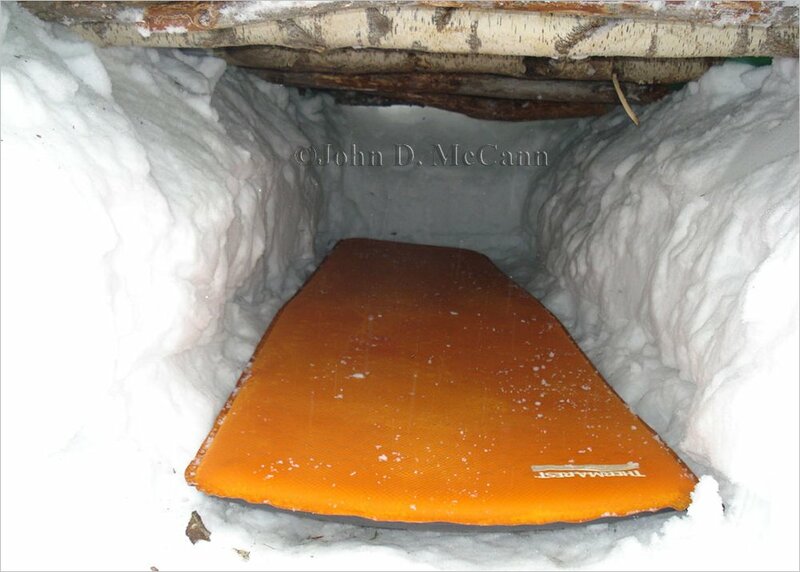 Keep in mind that snow shelters take considerable time to construct and require a lot of energy. The igloo, as mentioned, takes time, material, tools, and know-how. Snow caves, which many of us made as children are also time consuming, and you will probably recall getting real wet crawling around in the snow. You also need some real deep snow in order to make one. The snow mound shelter, also known as a "Quinzhee", can be made by piling up a lot of snow, using a shovel or even a snowshoe. You then pat the snow down and let it set for awhile so that it hardens, called sintering. You can also pile up a bunch of your equipment, or whatever stuff you can find, and cover it with snow. You must then excavate the inside by removing the equipment or material you used to mound the snow up on. As you can see, this is a time and labor intensive effort. The above described shelters are usually made entirely out of snow, and not with material you have in your kit. But in a real survival situation, the quicker you can make a shelter, the faster you will be protected from the elements. 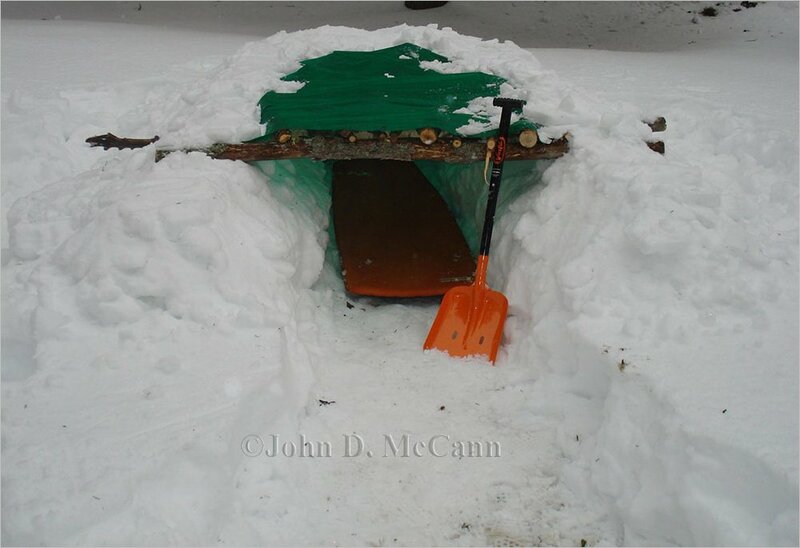 A shelter that is very practical is the Snow Trench. They are easy to make, require the least amount of effort, and are ideally suited for emergency use. Another advantage of making a Snow Trench is the minimal contact you have with the snow, decreasing your chance of getting wet while building it. 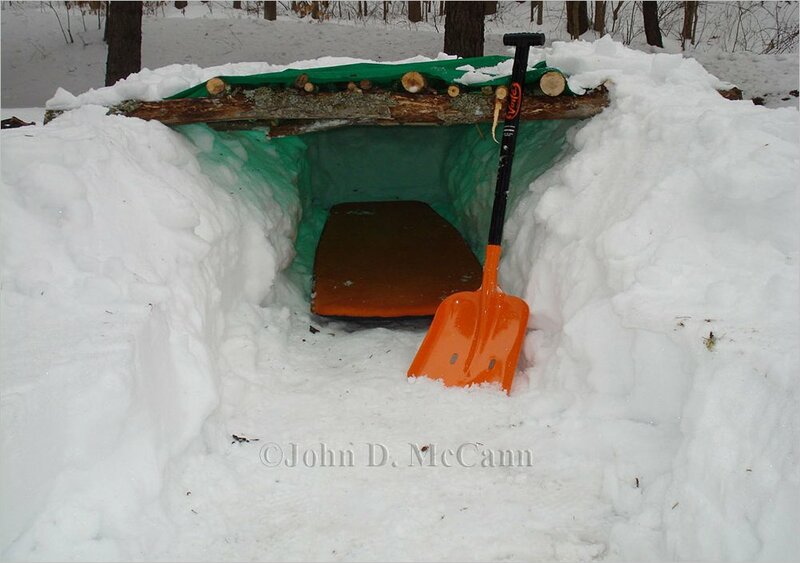 Each Snow Trench shelter should be made for one person. 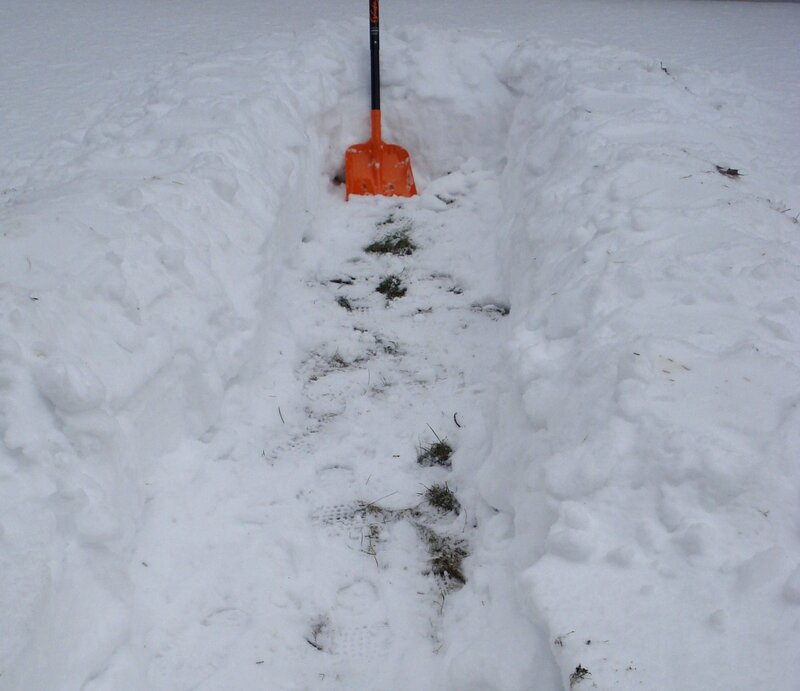 A Snow Trench is usually just a trench about three feet deep and slightly longer than your body. If the snow is not deep enough, you can build up the sides using the snow from the trench, as well as other snow around. It is very handy to have a shovel or something you can move snow with. Even the end of a snowshoe could help. up the side using the snow you remove from the trench. Once the trench is excavated, you can place long sticks, limbs, etc., over the trench, placing them from side to side, not the long way. One end should have an area where you can crawl into the shelter. Once the basic roof framework has been placed, you can cover that framework with boughs, or if available a tarp. The tarp works very well for this purpose. Secure the tarp by placing snow, first, around the outside edge. You can then place snow above the top, making sure that the framework is strong enough to hold the weight. A framework is made using limbs and sticks placed across top. the framework must be closer together to hold snow on top. Another view from the front of the tarp in place. Snow is added to the top of the framework, over the tarp, if you have one. On the inside, you will need insulation from the ground. If you were prepared, you will have a closed cell foam sleeping pad, or self inflating sleeping mat. If not, you will need to locate debris such as leaves (very difficult in heavy snow), pine needles, or boughs. This is another good time to have contractor garbage bags or the Orange Survival Bag. They can be filled with pine needles or other debris for use as insulation from the cold ground. you will have to use pine boughs or a contractor bag filled with debris. Once you are inside your Snow Trench, you cover the open end with a large pack, or even a contractor bag filled with snow. Just pull it up to the opening, leaving a small gap to ensure you get fresh air inside so you don't suffocate. 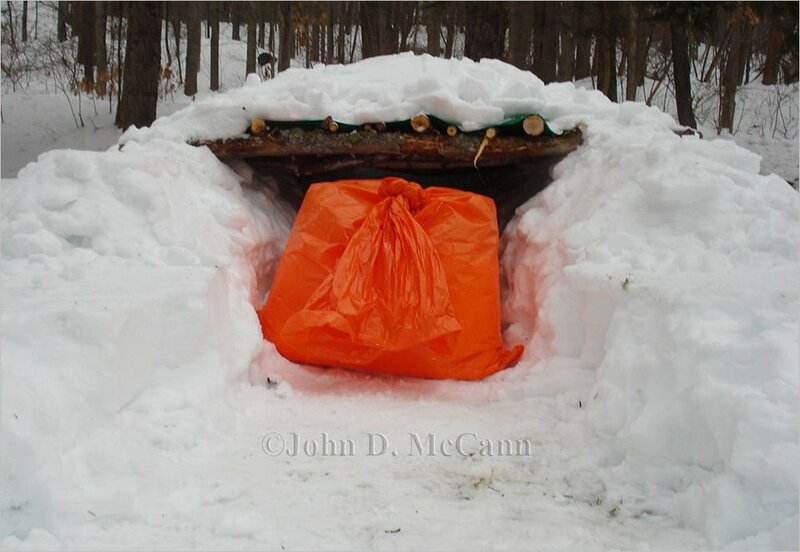 A large orange bag filled with snow is used to block the entrance. 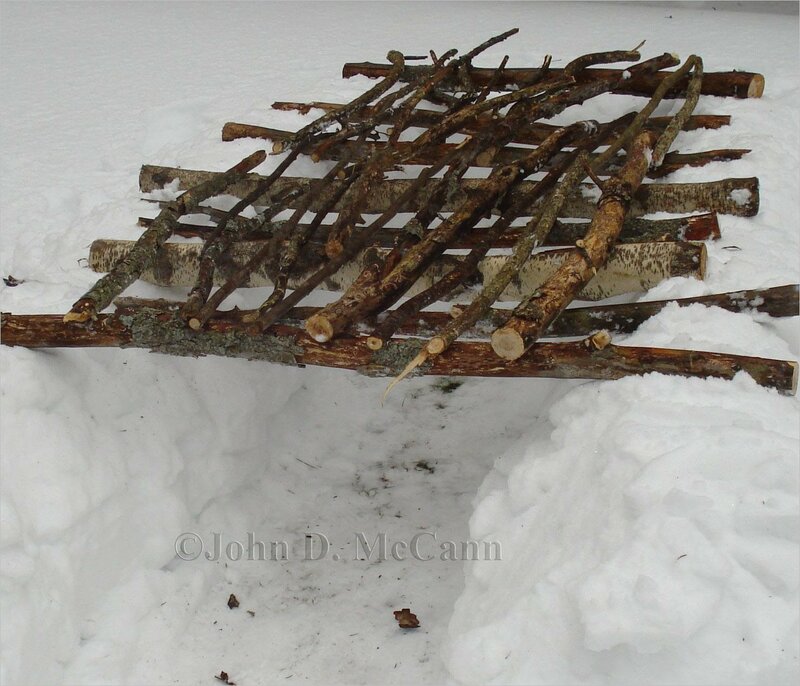 As this article illustrates, a Snow Trench is quicker and easier than other types of snow shelters, and can be constructed without crawling around in the snow. Give one a try sometime and I'm sure you'll like it. It could save your life in a real survival situation. We hope you enjoyed this article and will help support our efforts by checking out our products. As always, Be Prepared To Survive!